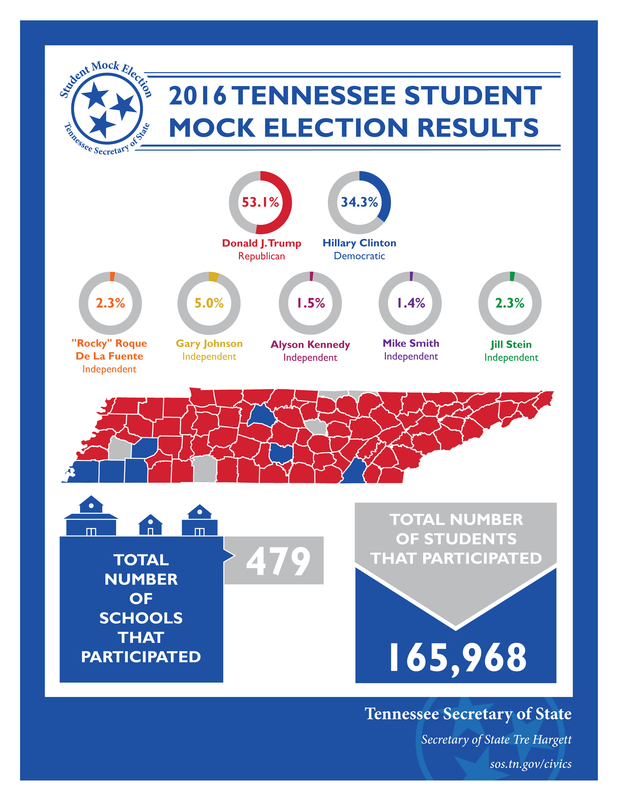 Tennessee students are now part of a major milestone after successfully voting in the first-ever statewide Student Mock Election. 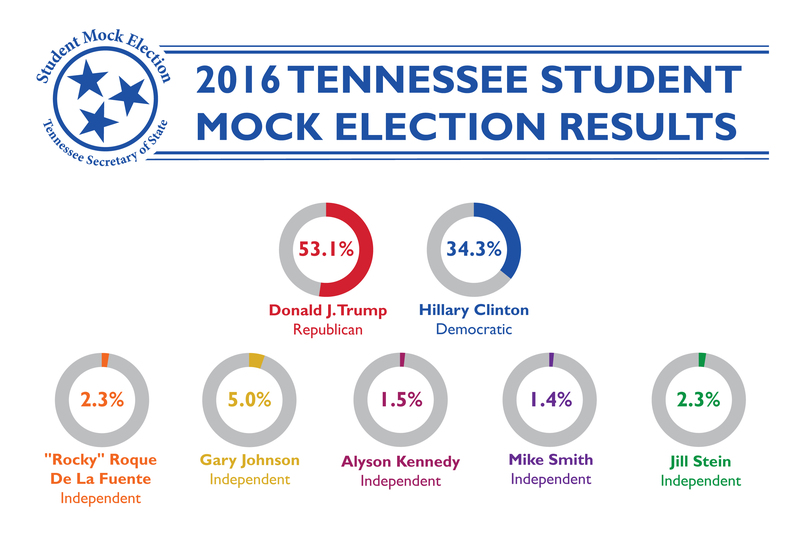 Donald Trump would be the next president of the United States if Tennessee students were casting real ballots. 165,968 students representing 479 schools from 90 of the state's 95 counties participated. "I'm thrilled that so many students and teachers from across our great state got behind this project with such passion," said Secretary of State Tre Hargett while announcing the results at Thurman Francis Arts Academy in Smyrna where the winner was decided by just four votes. "Hopefully giving civics such an important role in the classroom translates into engaged citizens who continue exercising their right to vote when they are old enough to vote in real elections." More in-depth results are available at here. Students in preschool through high school from public and private schools as well as home school associations in Tennessee participated. Ballots let students choose between Democratic presidential nominee Hillary Clinton, Republican presidential nominee Donald Trump and all qualified independent presidential candidates, but schools conducted elections locally in different ways. "We want our students to learn how the real world works. Almost weekly, representative government is a topic of discussion in our history classes," said Linette McFarlin who teaches seventh and eighth grade social studies at Thurman Francis Arts Academy. "Voting is a privilege and an important responsibility of citizens of the United States. We want our students to know it is their civic duty." Students are also entering an essay contest to encourage them to be actively engaged citizens. Essays topics will be about voting and length requirements vary by grade. Schools may submit two essays at each grade range. Winners from each range will receive a TNStars 529 College Savings Program scholarship worth $100, $250 or $500 in addition to a trip to the State Capitol. The essay submission deadline is Nov. 4. The program also offers lesson plans created by Tennessee teachers. The goal is to offer an easy way for teachers to incorporate civic engagement and citizenship into their curriculum.